Our quest for trekking gear landed us at Satya Niketan main market, opposite Sree Venkateshwara College on Saturday evening. The place was choke full of students, puffing away astride bikes, showing off biceps, slouching about or browsing books. All around billboards announced tuition for competitive examinations, there were gyms, book stalls, coffee houses and food stalls. 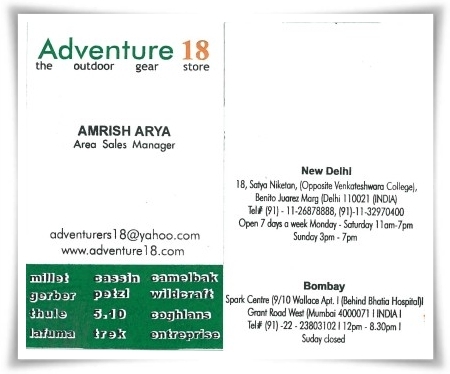 We found Adventure 18, the trekking and adventure gear shop we were looking for, at one end of the market. It had all we ever wanted. Once we were done browsing for gear, stomach took charge and directed us to the countless food stalls along the main market and side streets. One of them, 34 Chowringhee Lane, seemed to gather a disproportionate share of the clientele, more heads stuck to the counter like flies on jack fruit, than rest of the stalls. Occasionally some heads spun off this dark, buzzing, shifting mass holding large half chewed rolls (Frankies, if you please) and a dreamy look in the eyes. Precisely the epiphany we were waiting for. Pushing and jostling, I too joined the crowd and managed to place an order for double chicken roll. As I watched, the executive chef took out a glob of dough, flattened it between hands, stretched it with two master strokes of Belan, threw the resultant round bread into the vast Tawa, pressed it a couple of times with hand, flipped over, another hand press, smashed two eggs on it, a quick twirl, another flip, couple of stirs and out came the Parantha n egg base ready for stuffing. Sous-chefs placed chunks of chicken in a straight line along the centre of the Parantha, added a dressing of sliced onion, squeezed lemon juice and poured chilly and tomato sauce over the chicken chunks before wrapping it in tissue paper. I took this exquisite creation reverentially with both hands. The rest is history. The belly rules the mind – so goes the proverb. Take care of your belly and it will take care of your mind, so goes my interpretation. I’m a great stickler to this mantra and pamper by belly whenever possible hoping that my mind will follow. After the disastrous Okra restaurant episode (see post here), I could not rest in peace till my tummy had its quantum of solace. So I was only glad to grab the opportunity to visit IndiJoe, the American diner at Ambience Mall. Like Aromas of China, IndiJoe also belong to BJN group. It serves American, Mexican and Italian among others.The restaurant is spacious, the interior is done up in cool, dark shades; sports gear and photographs occupy every inch of the wall, a pensive miniature statue of liberty in verdigris preside over the middle bay, streaks of blood red fire sprinkler plumbing stand out against the black ceiling like exposed veins. Bright, translucent, green and blue stain glass lamp shades with flower patterns hang over illuminated tables, a collage of Hollywood stars – Harrison Ford, John Travolta, Marilyn Munroe and Sylvester Stallone decorate a side wall. Induction heated hot plates line the buffet counter against a frescoed back wall, there are separate Pasta and Chaat counters also near the buffet area, the bar counter near the entrance is empty at lunch hour with a lone barman bent over polishing glasses. Enrique Iglesias and Kenny Rogers issue softly from the music player. Eight of us share the only round table in the restaurant in a kind of pre-prandial limbo waiting to begin lunch. An aromatic cream of chicken soup accompanied by no-so-great Coastal Fried Fish in BBQ Sauce and tangy-sweet Honey Ginger Chicken tee me off. I give vegetarian stuff a pass and pile my plate with fillets of Grilled Fish in Lemon Butter Sauce and some Murg Shahi Patiala with thick spicy gravy to go with Paranthas. My dessert is a generous dollop of strawberry mousse and a heap of assorted fruits – mostly musk melon, pineapple and water melon. The lunch is infinitely satisfying and call for suppressed burps – which is the stomach’s way of announcing deep satisfaction. 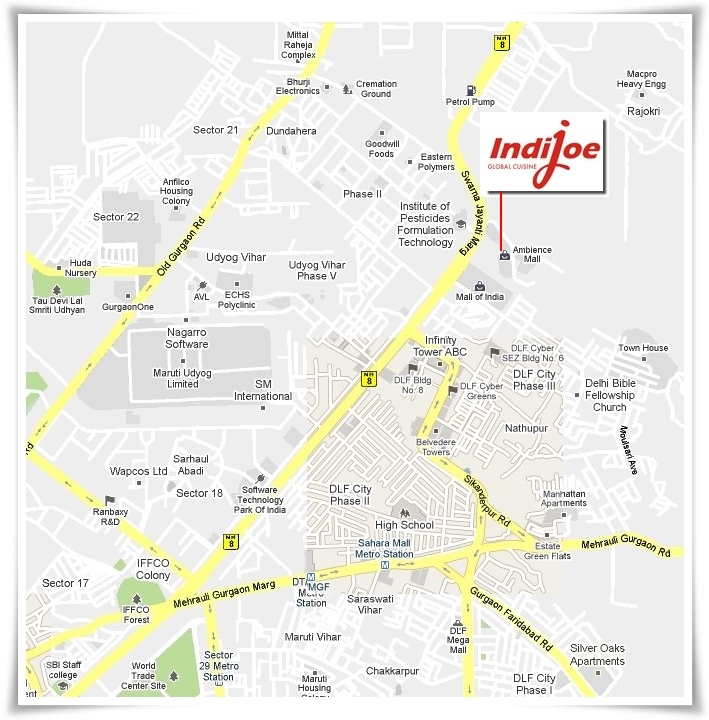 For Rs.350/- + taxes (Mon – Thru), IndiJoe is a definite bargain – the staff are friendly and helpful, food bountiful and diverse, the restaurant is clean, spacious and very relaxing. Fri – Sun the going rate is Rs.425/- + taxes which includes additional dishes such as prawns. On Fridays there is also a live band from 9.00 PM onwards. Waking up on a chill December morning is an ordeal. It was still dark and cold when we loaded up sandwiches and water in the car and headed for Sariska at dawn. 50 km down NH-8 to Dharuhera, we took the left turn to Bhiwadi; 10 km further realized that we were probably going in the wrong direction, made enquiries, veered around and came upon the turn to Alwar. A few shoe shops, a juice vendor, a tree and this road inside. That was it! No signage! At a junction further ahead we stopped again and asked for directions, turned right and took the road beside Ashiana village, another left and an immediate right and we were on Alwar Bypass. 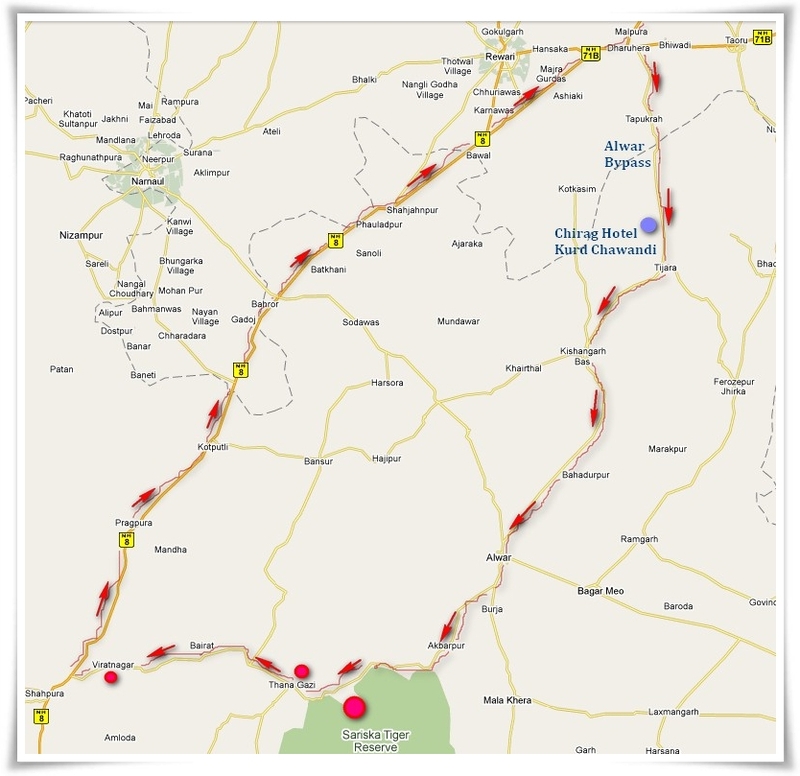 It struck us that while driving on Indian roads “SPOKEN DIRECTIONS” are far more reliable than written ones. Signages are few, often misleading, either plastered over with posters or well concealed from view. The best thing is to ask pedestrians or bystanders when in doubt. Driving down the sunlit country road flanked by glorious yellow-green mustard fields shrouded in early morning mist was sheer pleasure. At Kurd Chawandi near Tijara we stopped to breakfast on ‘garam-garam’ Aloo-Pyaz, Mixed Paranthas and hot tea, at Chirag restaurant – a shudh shakahari, pavitr hotel. The single lane road was practically traffic-free. 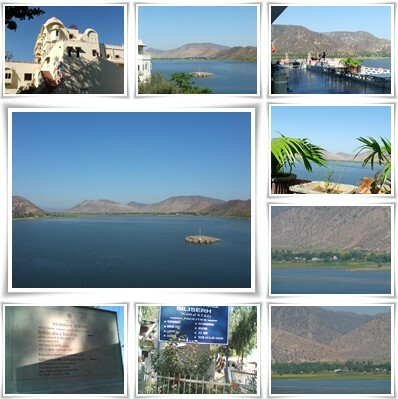 Aravali hills formed a corrugated backdrop against panoramic vistas of emerald green fields. Mid morning, after a brief wait at a railway level cross near Alwar, we took the right turn from the second roundabout, passed over another railway crossing and sped along the road immediately to the left. At a fork we took the uphill road on the right which led straight to Sariska, 40 km further on. The blue signboard announcing Siliserh Lake Palace Hotel was easy to miss. The narrow, badly maintained road to the palace wound along an ancient aqueduct; bordered by eucalyptus trees, gooseberry orchards and lush green fields. Heavy traffic of motorbikes, Jugaads and jeeps on the road frequently forced us off the tarmac. There were several eating joints beside a large pool at the point where the road climbed towards the palace hotel. Inside the compound, there was just enough space to park about 10 cars. The palace which was built by Maharajah Vinay Singh of Alwar in 1845 as a hunting lodge have recently been converted into a heritage hotel maintained by RTDC. We paid the entrance fee and climbed up to a balcony. Down below, the azure lake lay shimmering in the clasp of grubby, fractured sandstone hills; tinged yellow along the brim by mustard blossoms. There were birds along the lake edge; near the shore an old man in white ploughed the field with a white bullock; we could see villages in the distance. A strong wind ruffled our hair and bent potted plants kept along balustrades where guests sunned themselves. We sat sipping tea on the balcony for a while, taking in the idyllic setting. Back at the car park, we found clean, spotless toilets close by. Refreshed, relieved we resumed our journey to the sanctuary. The road became progressively worse as we neared Sariska. For a kilometer or two within sanctuary limits we were forced to grind along edges of cavernous potholes in low gear. 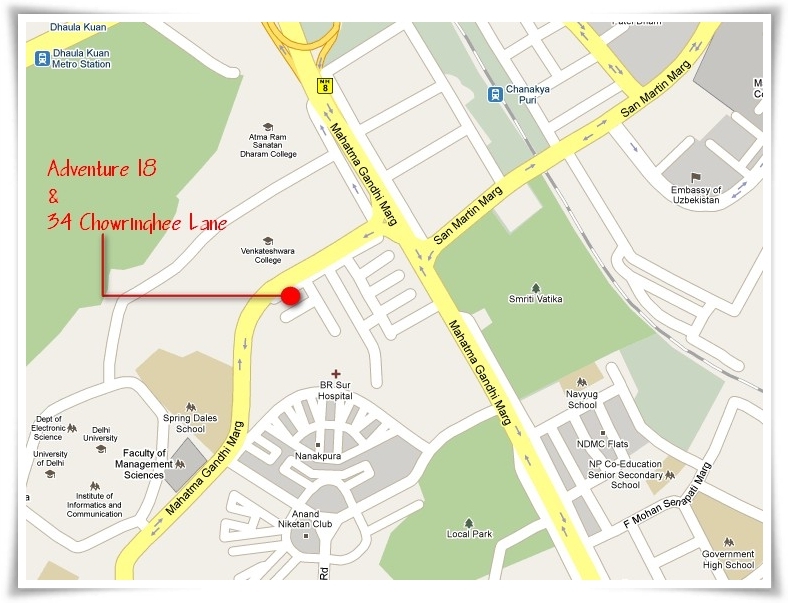 Entry tickets were available from the Project Tiger counter located on the main road, 500 meters from the sanctuary gate. We could either take our car or hire open air Maruti Gypsies run by the forest department. We chose to drive ourselves. At the sanctuary main gate we had to provide vehicle and driver name for records. The sanctuary rules prohibited us from straying off the main road. Playing music on car stereo was not permitted. Under no circumstances were we to step out of the car. The asphalt road within the sanctuary was in bad shape. Possibly intentional – it helped to limit speed within the stipulated 30 kmph. We drove along at a snail’s pace scanning the the jungle on either side of the road. My wife was the first to catch sight of a wild boar. It seemed quite unconcerned by our presence and continued to munch grass. Uncharitably, the first image which flashed across my mind was that of Obelix grilling wild boar over bonfire. 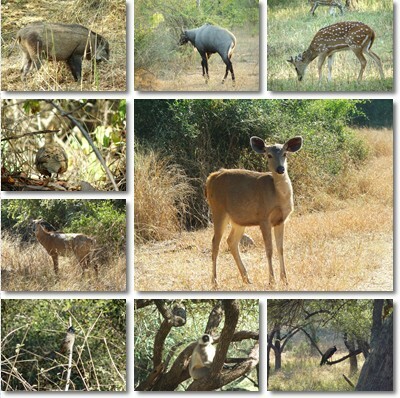 Further down the road we spotted groups of peafowl, Sambar, Nilgai and Chital. They peered at us curiously but did not pay us much attention when we stopped close by. Trees closed in as we moved deeper into the jungle. This was dry deciduous forest and foliage was not very dense. At several places it opened up into savannahs of brown grass. Occasionally a Sambar or Chital streaked across the road. Sometimes they paused to stare before vanishing into the undergrowth. A pack of jackals, brownish, with ears perked up, strolled along the road. Grey Partridges waddled about picking at the ground and jumped inside thickets as we approached. Peafowl were everywhere, on the road, under the shade, top of trees; the peacock easily spotted because of its fluorescent blue green feathers. Several parrots roosted on a bare tree, giving it a transient pale green foliage. 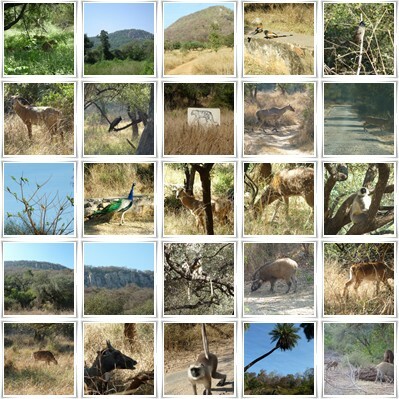 Signboards along the road announced the distinguished residents of Sariska – caracal, leopard, tiger! 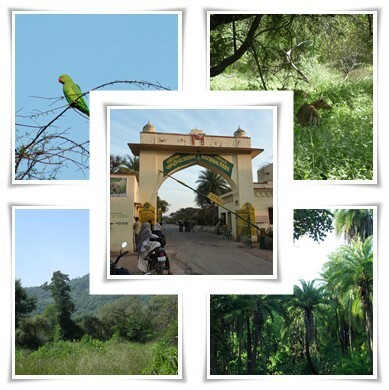 In 2005, the sanctuary earned the dubious distinction of being a tiger reserve sans tiger. Three tigers have since been reintroduced and are reported to be faring well. We were fortunate to spot this one!!! Langurs – black faced and long tailed stalked the road in groups, hoping to be fed by visitors. On one occasion we stopped the car to feed them and got mobbed by the gang. They climbed over the car, stuck to the windshield, perched on side mirrors and tried to insert fingers through windows. Later, forest officials reprimanded us for feeding them. We understood that instead of helping them, we were harming them. By giving them food we discouraged animals from foraging which was ultimately detrimental to their well-being. The main road ended at Pandupol temple, dedicated to Hanuman. Langurs and Rhesus monkeys walked about unmolested, under the auspices of the monkey god. 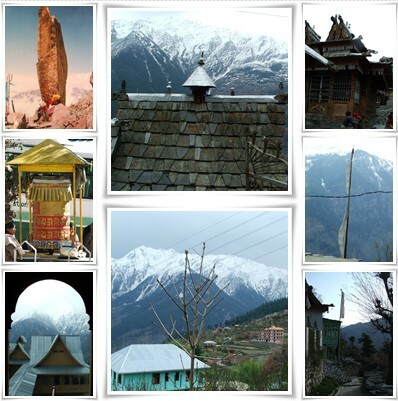 According to legends, Pandavas spent part of their Vanavas here. The stone arch over a cascade is reputed to have been created by Bhim by smashing his mace (Gada) on the rock. We parked our car near the temple entrance and walked a little way inside. Water trickled over large smooth boulders, there were silver fish in stagnant pools, a Sambar stared at us from inside a palm groove, squirrels scurried about, a kingfisher sat perched on a palm tree, all around it was quiet except for the rustle of leaves. Back at the temple there were a group of cacophonous pilgrims. Near the sign which exhorted to keep the temple premises clean, a man performed his daily ablutions. A visit to the stinking toilet and the litter was sufficient for us to drop the idea of having samosas from nearby shops. The sanctuary gate was close to 25 kms from the temple. It was getting late, the slanting evening sun rays had withdrawn to cliff tops. We turned left from the sanctuary gate intending to return via NH-8 instead of Alwar. A dilapidated fort over looked Thana Gazi town where we stopped to fuel. A short snack break at Virat Nagar and we hurried on to Shahpura where the road met NH-8. Driving on the pitch dark country road with oncoming vehicles on high beam was extremely difficult. We breathed a sigh of relief as we touched the highway. NH-8 was choke full of trucks which necessitated frequent lane shifts and weaving through traffic. It was late night when we reached Gurgaon, braving traffic jams, rogue drivers and wheezing trucks. Although we couldn’t spot the star attraction of the sanctuary, it was a delightful experience. During the visit, we noticed several people step out of their vehicles violating the sanctuary rules. People flung tea cups out of the car and littered several spots. We were ourselves guilty of feeding animals, for our pleasure and for the fantastic photo op. I hope we all realize that the wildlife sanctuary is the home of animals – they are born and raised there, that’s where they live and die. As guests enjoying their hospitality and goodwill it is our responsibility to respect the animals and their environment instead of spoiling it. We should stop being selfish, at least for the while we are being with them. Note: Preferably carry food and water. Once inside the sanctuary, nothing will be available until you reach the Hanuman temple. The food available near the temple is not clean or hygenic. Warning: Entry to the reserve is free on Saturdays. But noisy pilgrims throng the temple. Hords of schoolchildren descend on the sanctuary. Buses honk you off the road. In my opinion, avoid visiting Sariska on Saturdays.